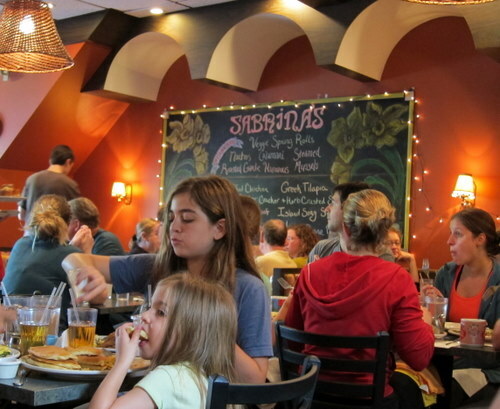 I’ve been to Sabrina’s in Bella Vista a bunch of times. I thought we could check out the Fairmount one, just for kicks. I knew that it would be crowded, but unfortunately, I didn’t know there was also a 5k that sunday, as well as a parade, or that you could call ahead. These all seemed like noob mistakes. Luckily, things moved quickly, and we didn’t have to wait that long. Once inside, it’s completely packed to the gills, at the tables and at the counter. And it’s all hustle and bustle in there. 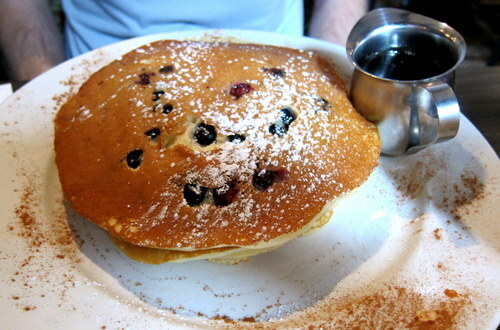 M’s full stack of blueberry pancakes. This is an impressive heap of big pancakes. He put forth a valiant effort and pretty much ate it all. I love that there’s a dusting of powdered sugar and cinnamon. 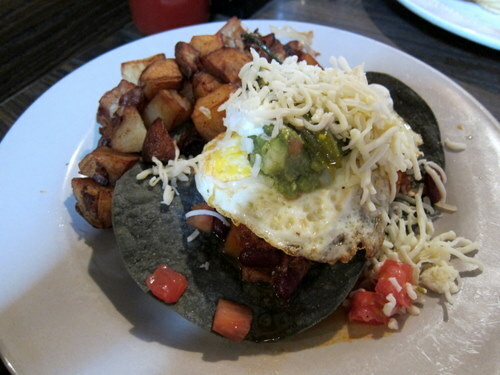 I went with the huevos rancheros, which is a go-to dish of mine for brunch. It’s hearty, filling, savory, and delicious. The potatoes that came with it were also great. Service was ok, they’re really damn busy here. It can seem a little harried. But as far as solid brunch options go, you can never go with any of the Sabrina’s.